If you're an individual with mobility impairment due to age or physical disability, you know the challenges of limited accessibility. Ramps and elevators have come a long way in helping increase access to places that were once out of reach; however, they're not universally applicable. Space, one of the most common constraints, can hamper the installation of assistive technology. Enclosed model – In this lift, both the wheelchair and rider are placed on a lift confined within walls. Shaftway model – This lift is often fixed to existing walls in commercial buildings to create a seamless appearance. Stage model – Often used to access areas of shorter heights, such as a stage or a vehicle, this model features an open platform. Opal model – This lift is similar to the enclosed model apart from its open ceiling. Vertical wheelchair lifts can be installed in a variety of different locations where space is an issue. 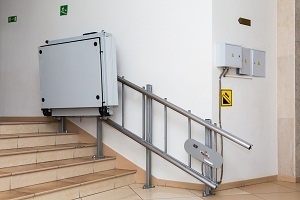 For areas in which the standards and guidelines of the Americans with Disabilities Act (ADA) are not possible, a vertical platform lift can be a cost-effective alternative. With the right lift for your situation, you can enjoy the mobility that a vertical lift offers. Many of these lifts are created for indoor and outdoor use so that you can enjoy your day the way you see fit. The benefits these lifts offer let you enjoy a more action-oriented and independent life. You don’t have to be limited by your wheelchair or disability because accessibility is commonplace. With the right lift for your situation, you can enjoy everything that's offered.